"I was amazed at how flexible the WOW architecture is - you can really extend WOW to make it look, feel, and run exactly the way you want it." 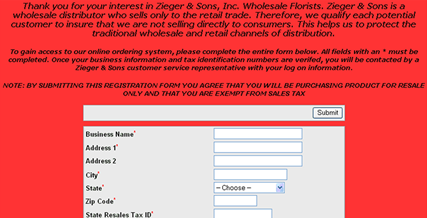 Zieger & Sons, headquartered in Pennsylvania, is a family owned Wholesale Florists. 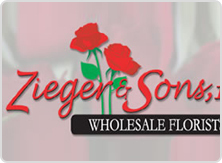 Since 1910, Zieger & Sons has been a premier provider of wholesale floral supplies and fresh flowers to Professional Florists. They continue to dedicate themselves to being the best wholesale distributor – using technology to help make them a leading force in the industry in terms of delivering a wide assortment of fine quality cut flowers and being the best in customer service. As Zieger & Sons expands their business to b2b operations, an immediate need was registering new customers from all over the country and having this customer data deposited directly on the AS/400. Additionally, existing Zieger customers and internal sales representatives desired the ability to search Customer Purchase and Invoice Histories. PlanetJ created a simple, but powerful, customer registration application for new customers. Once the application is completed, the customer's information is recorded directly on the AS/400. Also, another application was created for existing users to allow them to search and view their invoice and purchase histories. A new and more efficient method for customers to be recorded into the AS/400 was needed. Furthermore, a powerful - yet simple - tool was also needed for existing customers to view their purchase histories. From the "Register Now," a new registration form is displayed in a separate window. This is followed with a confirmation screen after the application has been filled out and submitted. Once completed and submitted, the customer's information is recorded directly on the AS/400. An AS/400 application running in the background recognizes and pre-processes the registration request. An e-mail is sent to the Zieger Sales Manager to inform them of a new customer registration - where it can be reviewed and approved or denied. A second e-mail is then sent to the customer with further instructions. Existing users can use the "Log In" or "My Account Central" link in order to access this application. PlanetJ's WOW tool allows for Zieger & Sons to develop applications much more efficiently that, in turn, provides for very streamlined applications that are automated and require minimum hands-on processing. Jay Pierce, president of JRP & Associates, LLC, commented: "Initial development time was very rapid - the fine tuning takes a bit longer when you are new to the product; however, for an experienced WOW developer, this fine tuning is very streamlined." Zeiger & Sons, Inc. was able to expand their marketplace from just the northeastern corridor of the United States to the entire country. The WOW server allowed for them to develop a simple application to register new customers from all across the country. The MyAccount Central application increased customer satisfaction. It gives the customer the freedom to inquiry their account history at any time. Additionally, this frees up sales representatives to focus on getting the next order.